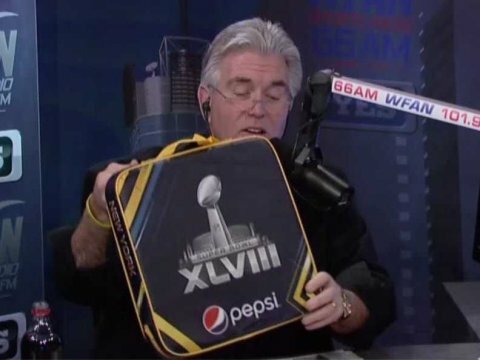 In anticipation of the New Jersey Super Bowl and the possibility of bad weather, everybody attending this year’s big game will receive a seat cushion with an attached gift bag that includes a number of items to help the fans stay warm. 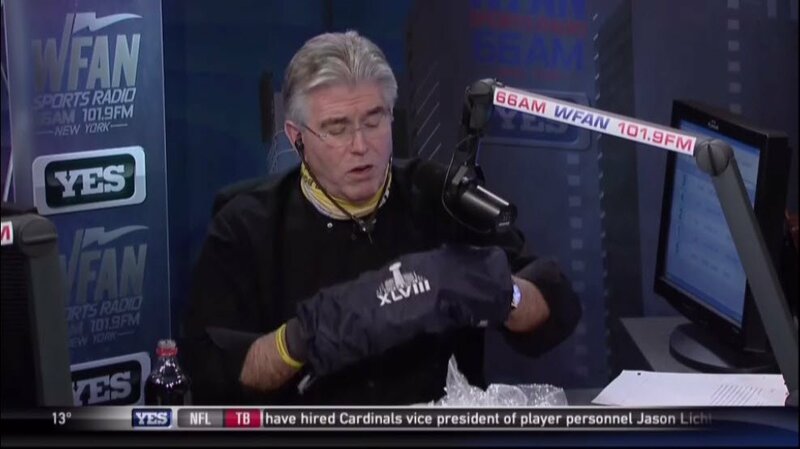 Mike Francesa of WFAN in New York City got ahold of one of the Super Bowl seat cushions and revealed all of the items in the bag. 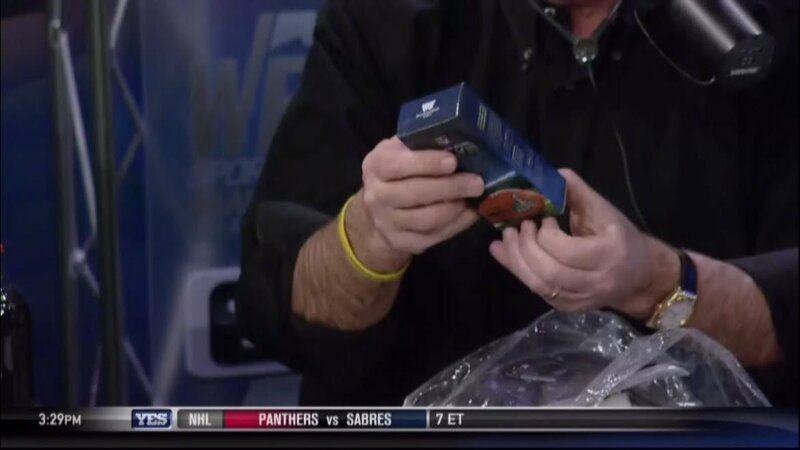 Most of the items are what you would expect, including hand warmers, gloves, tissues, a wool cap, chapstick, and an in-house radio to listen to the broadcast (see images below). 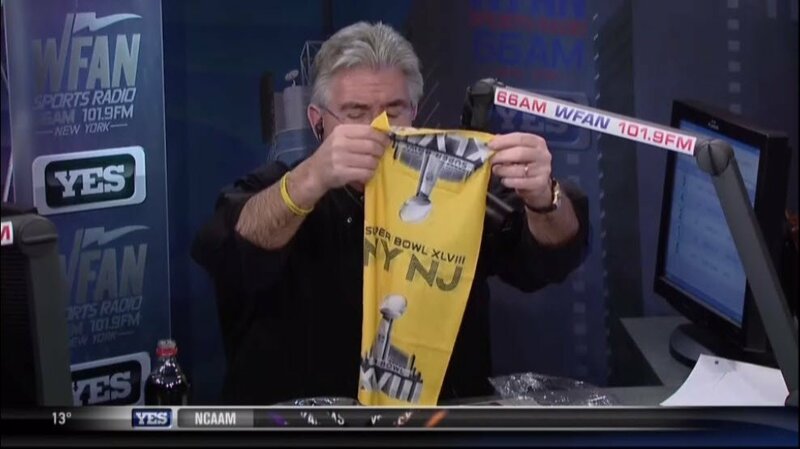 While the items look pretty cool, at least one of the items may not be useful for many of the fans at the game. 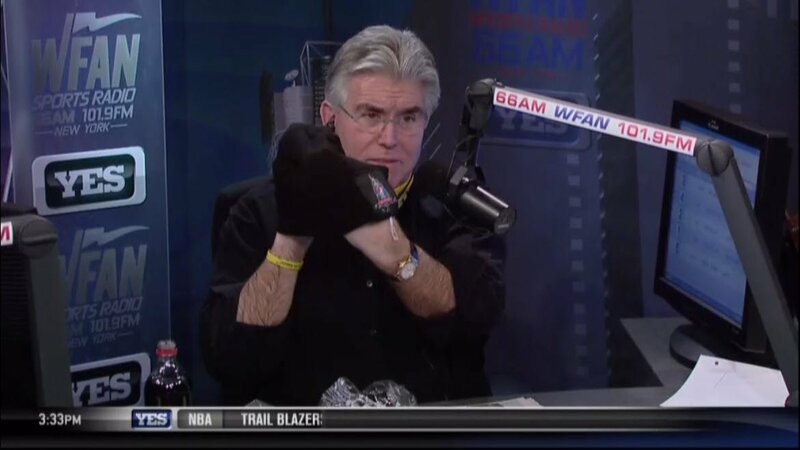 When Francesa attempted to try on the ear warmers, it led to a funny scene in which it turned out the ear warmers were just way too small. Fans will also receive a bandana-like item that can be wrapped around your face or neck. 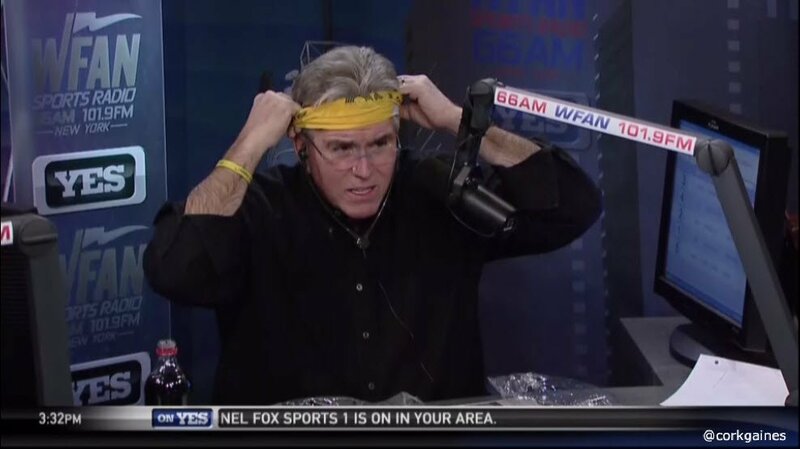 Here is Francesa putting it around his head. Fans will also get hand warmers that look a lot like the type football players used to wear on the field. 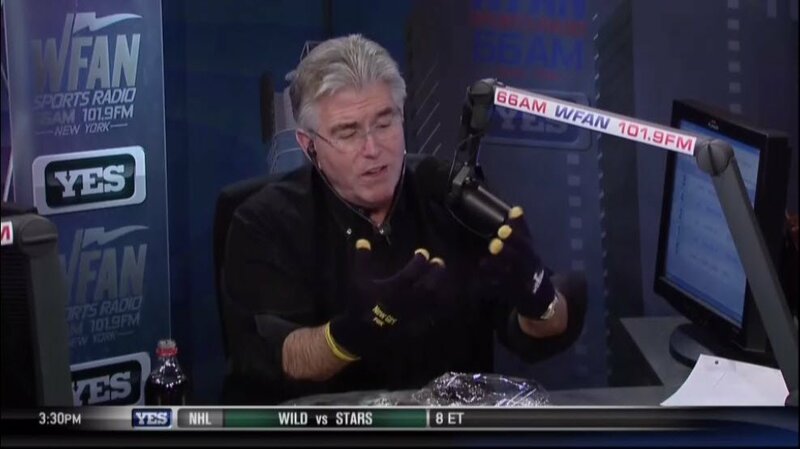 Here is the knit cap (Francesa said he didn’t want to mess up his hair). Finally, here is the in-house radio. There are some pretty neat items included in the gift bag to attendees. What is your favorite item? It’s November and the holidays are right around the corner. However, it’s not too late to still get logoed items as gifts for your clients and employees. Below are a few tips to consider when making your holiday gift decisions. Your business exists in a small town. The name of that small town is The Internet. Now, via social media channels, your clients can tell their 367 Facebook friends and 852 Twitter followers whether or not they liked working with you in 5 seconds or less. That makes what your clients think of you more important than ever. Mediocre is not worth sharing. When you do something remarkable for your clients, you give them something to tweet about it. 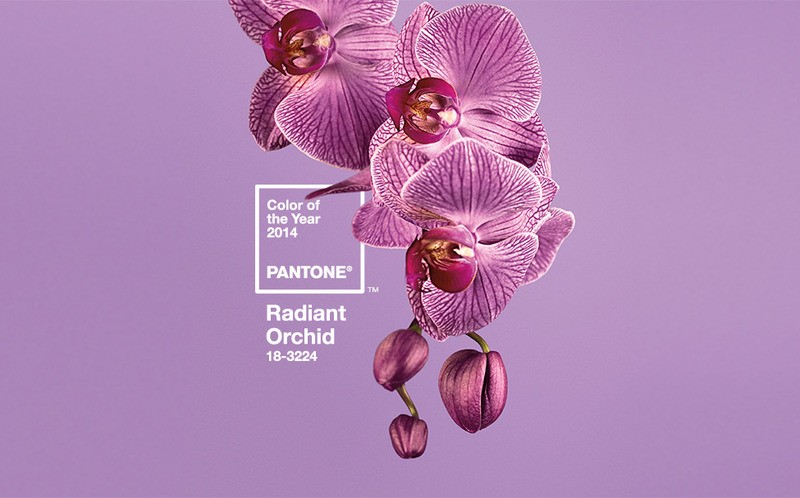 So give your clients a gift that will invoke shock and awe or at least wow and delight them. It will improve your client’s experience with your business, making them happy and cause them to share their experience. Which in turn makes you happy because of all the referrals that will come streaming in. It is not appropriate to give gifts that are too personal. Personal is good. Too personal is offensive. Giving a client that enjoys camping a leather-encased stainless steel thermos for coffee or hot chocolate shows that you remember his interests. It would not be appropriate, however, to give that client thermal clothing. The gift should be thoughtful and personal while keeping the relationship professional. Since the economy is only somewhat improved, not all companies can afford to give clients gifts. And many companies have too many clients to make gift-giving possible. In that case, a personalized holiday card will suffice. People appreciate the thought that goes into sending a card with a thoughtful handwritten note expressing how much their business and relationship is appreciated. Even small gestures can go a long way. Companies should take the time to find out which holiday a client celebrates. Then an appropriate gift should be delivered on time for that holiday. Regardless of faith, make sure gifts are delivered early enough so that clients receive them before they take time off to celebrate the holiday… whichever holiday. Another great idea is to give your gifts early or closer to Thanksgiving. Your gift will stand out on its own instead of getting lost in the shuffle of other gifts and cards coming in December. If you are giving a promotional gift item at the end of the year to a client, an associate, or a co-worker, choose something that might have a value beyond just that particular point in time. Desk items make a great gift and can also be engraved. Desk items can include clocks, pen set, paperweights, bookends, desk organizers, etc. Consider beautiful trophy-like awards and also go beyond that to consider different versions of that such as a crystal vase or bowl, or a fancy canister or box. Dual purpose items stay in front of your client longer. Keep in mind that holiday gifts do not necessarily need to be focused on a particular holiday or religious observance. You’ll likely have customers and associates that cover quite a range of affiliations. It might even be safer to refer to your gift as a Winter Gift or a End-of-Year or a New Year’s Gift. If you can’t seem to find the perfect gift, consider making your own gift set. Use the gift basket concept and put together a few related items. Combine a pen with a notebook or padfolio. Combine an umbrella with a tote bag. If appropriate, consider choosing a product that centers on a particular theme such as: golf, wine, tools, health, or travel. Don’t forget to ask to have your gift item wrapped or packaged in an appropriately sized gift box, gift bag, or gift basket. Please let us know how we can help you provide a memorable gift to your clients and employees.